Rather than write a full blown review, here are fifteen observations about Guardians of the Galaxy. See if you can guess if I liked it! Posted in Films on Friday, August 15th 2014. Finally saw Guardians of the Galaxy today. Here are fifteen observations about the film that may or may not constitute a short review. At least two Oscars for Best Use Of Body Paint (Green) and Best Use Of Body Paint (Blue) are sewn up. Chris Pratt basically plays Star Lord as “Andy Dwyer in space” and this is fine by me. Best movie to feature a talking raccoon in a long time. Watching the entirety of the end credits of Thor 2 paid off! “WE are Groot” — aren’t we just?! All of the feels. It features a dance off as a major event, something that it shares with the Step Up movies. Guardians of the Galaxy is a waaaay better movie. The first words of the credits are “The Guardians of the Galaxy will return”. It is in fact a movie that reviews itself. The 3D version might have been pretty good. I watched the 2D version but the scenes with lots of action might be improved with a bit of depth. A great soundtrack, but there is a cheesy “smooth rock wins chicks” bit that’s a little icky half way through. That said, the description of the legend of Footloose is hilarious. Especially the callback toward the end of the movie. I especially enjoyed the scene with the Collector. 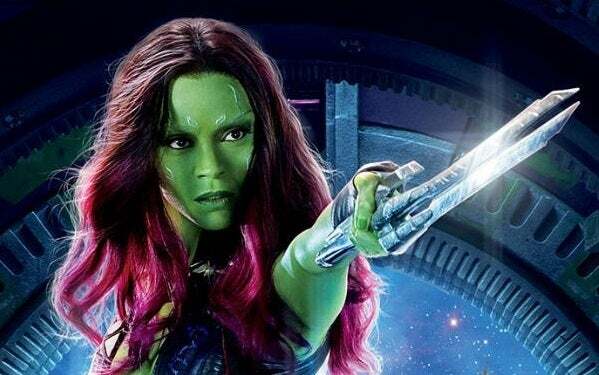 Karen Gillen is wasted as Nebula, but hopefully she will be back. Karen’s also in what may well be one of the most ill-conceived TV shows of all time later this autumn. If you text me at any point in the next month, I will probably reply with “I am Groot”.